MyPlayer Archetypes are a really good idea in terms of encouraging gamers to create realistic players, and preserving competitive balance in online play. As one of archetypes of NBA 2K17, MyPlayer Archetypes have lots of restrictive nature. 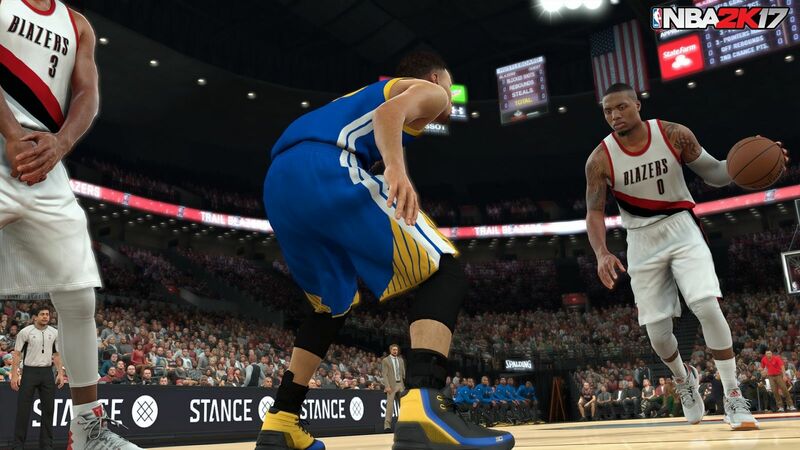 In preserving competitive balance, MyPlayer Archetypes is not as effective as it should be. Each Archetype in NBA 2K17 has at least one significant drawback. For example, if you choose the Playmaker Point Guard Archetype, you’ll be giving up a significant amount of upgrade levels for your outside shooting. Likewise, levelled-up Slashers are excellent at getting to the rim and finishing, but their shooting ratings are also rather harshly capped. Except injecting a little more realism into MyCareer, MyPlayer Archetypes seemed to be a logical answer to egregious min-maxing and gaming of the upgrade system in order to create overpowered players. When you choose between the MyPlayer Archetypes, you really have to weigh up the beneficial strengths against the glaring weaknesses. It makes it more difficult to create a ridiculously overpowered player, and in many respects, the strengths and weaknesses of the MyPlayer Archetypes do realistically represent the different playing styles we see among NBA players. With that being said, we do see multi-talented players who have a hybrid of styles, or at the very least, are better in certain areas than the current MyPlayer Archetypes would suggest. As a result, some Archetypes aren’t the viable options they should be, forcing gamers to pick between a few Archetypes that they can creatively min-max for online play. If you focus on updating ratings outside of your core skill set, you can actually change your player type, too. This might not be feasible with NBA 2K, however, since there is a wider array of MyPlayer Archetypes, and gamers can upgrade their players through microtransactions. It should be possible to develop into more of a hybrid Archetype. One way of achieving this would be to keep the current approach to level caps, but allow players to gain extra upgrades above the cap through putting in the work in training sessions. For example, if you wanted to be a Playmaker who’s a great outside shooter like Mark Price, Steve Nash, or Stephen Curry, it should be feasible by selecting the Archetype, and working on your three-point shooting in drills. It will be greater if level caps can be higher or the maximum rating at the current level caps can be increased. For areas that are intended to be the weaker parts of a player’s game, then the maximum achievable rating through purchasable upgrades should be around the league average. And the starting ratings in areas related to the Archetype be higher, and cheaper to upgrade. Low starting ratings are a problem in general, but it’s silly that a top prospect should have key skills that are significantly below average. Another possible improvement would be the ability to nominate and “tag” a few key skills. These skills could start out higher, level up easier, have higher than normal caps, or ideally, all three. In addition to providing a leg up at the beginning of your career, it would also effectively allow you to customise MyPlayer Archetypes. This would make it possible to create styles that currently aren’t represented, such as great lockdown defenders who are also deadly three-point marksmen, a la Bruce Bowen. Customising MyPlayer Archetypes would be to allow the increase of one area at the expense of another. For example, if you wanted to increase your three-point shooting cap, you could elect to do so, but it would involve sacrificing a level from post scoring, or some other area of your choosing. This would allow for some flexibility in the Archetypes while preventing players from becoming overpowered, as increasing the level cap in one area would either result in another area becoming much weaker, or alternatively, lower level caps across the board. At the same time, there are areas where it would probably be a good idea to nerf some ratings, and adjust the impact of physical attributes. Creating a 7’3″ player with long arms shouldn’t be a quick route to being unstoppable on the offensive glass, or swatting shots. Depending on their ratings and other physical attributes – to say nothing of how well they’re being controlled by the user – they should fall victim to being effectively boxed out, outmuscled, and committing fouls due to a lack of defensive skill and body control. In short, cheesy builds should be difficult to create, and physical gifts should be combined with skill to be truly effective. There is a suggestion that certain Player Badges be more difficult to obtain depending on your Archetype, or have additional requirements. Restricting Badges a little more would be a fair trade-off for higher level caps and ratings, and customised MyPlayer Archetypes. There's still have room for improvement for MyPlayer Archetypes in NBA 2K17, and it's no doubt that the game will be greater after the changes have been done.